Introducing a new puppy, especially to toddlers, should be done with care to avoid injury to either your children or the puppy. Once they start walking, toddlers can become more interesting—and challenging—for your puppy. While young children may mean no harm, depending on their age, they may treat your puppy like a stuffed toy by poking eyes, pulling fur, chasing or trying to hug or kiss the dog. 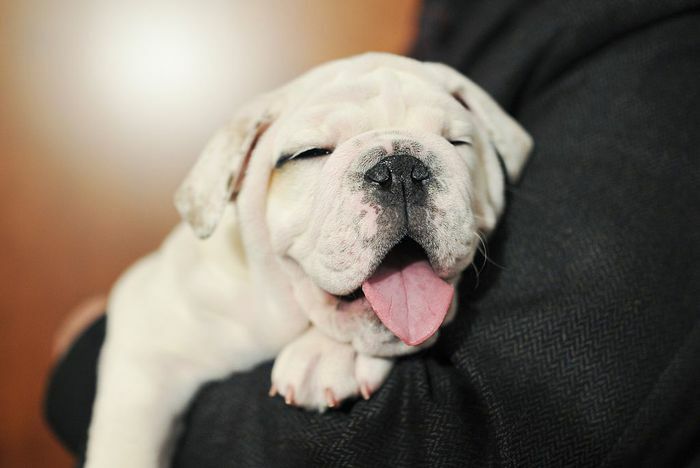 A frightened or injured pup instinctively may respond by biting and growling. It's important to set some clear boundaries between your puppy and your toddler so that they can learn to trust each other without anyone getting hurt. Be sure your puppy has a canine sanctuary that’s off limits to kids. Even pets that adore children need private time and a place to go where they know they won’t be pestered. Make a bedroom, or the puppy’s crate and bed, off-limits to the children, and supervise to enforce the rule if the children are too young to understand. Before allowing it near a dog, ask a toddler to practice petting a stuffed toy or the child’s own arm or head. Young kids should be taught that dogs aren’t stuffed animals, and can be hurt and lash out from pulled tails or ears. High pitched screams, the typical way an excited toddler communicates, could potentially prompt a puppy to become aggressive to a child. Challenge children to a game, to see if they can talk in an inside voice that entices puppies to come closer for petting or treats. You can explain that just like children can get frightened of scary sounds, puppies can be scared and it takes very talented kids to know how to be pup-friendly. 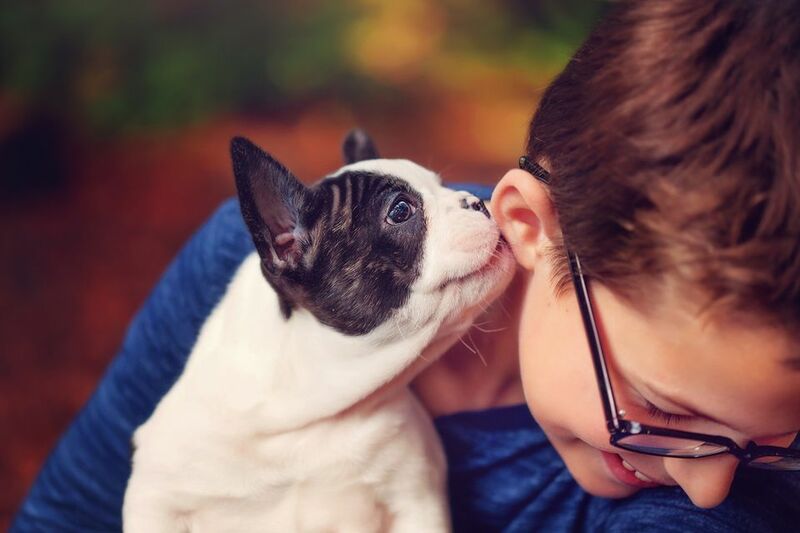 Just as you reward the puppy with praise for good behavior, make sure the child knows you appreciate its sensitivity toward the dog. Staring is a challenge in dog language that can stress some pets, especially from kids that are at a dog's eye level. But when ignored, pups are more likely to be intrigued enough to investigate on their own. So challenge your toddler or older child to an “ignore the pup” game, and see how long they can pretend the puppy is invisible. In most cases, a confident canine will eventually approach. It may approach and retreat quickly, but will likely approach again if it doesn't get any negative reaction. Puppies take turns playing chase-and-tackle games with each other, so when chased by toddlers they may get too rough without meaning to. Make it a dog rule that young kids must sit before they can pet the dog and that the dog gets to approach. That also lets the pup control interactions and move away when the puppy has had enough. Forcing a dog to sit still for a child’s unwanted attention may cause the puppy to avoid the child in the future. This instead makes it the dog’s choice and a fun, rewarding experience. Once seated, the child can lure and entice the puppy with a toy. Playing builds a positive relationship that can grow into love. When pups still act reluctant to approach, find a special tasty treat the pet loves but only gets from the child. While sitting on the floor, the child should gently toss the treat to (not at) the dog. Until or unless you’re satisfied the puppy won’t also nip the child’s hands, make sure that the treat gets eaten from the floor rather than your child's fingers. There are always exceptions, but as a general rule, children should be at least 6 or 7 years old before being given responsibility for a puppy’s care. However, you can begin at this age with supervised care duties, such as filling the puppy’s water bowl or teaching how to comb and groom the fur coat. The more pleasant experiences your children enjoy with the puppy, the stronger the bond between them. Kids smell different than adults, have high-pitched funny voices, move in unpredictable ways, and can appear threatening. Don’t expect every dog to feel the same about your kiddos. Some big pups may love playing “pony” with a visiting toddler but a clueless young child could seriously injure small pups without meaning to. Be on guard for any kid-puppy interaction to make sure everyone is behaving.